Wheat blast is a fearsome fungal disease of wheat. It was first discovered in Paraná State of Brazil in 1985. It spread rapidly to other South American countries such as Bolivia, Paraguay, and Argentina, where it infects up to 3 million hectares and causes serious crop losses. Wheat blast was also detected in Kentucky, USA, in 2011. 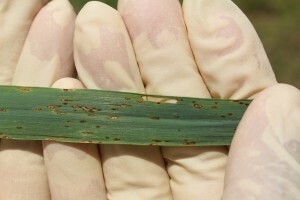 Wheat blast is caused by a fungus known as Magnaporthe oryzae (syn. Pyricularia oryzae). There is a risk that wheat blast could expand beyond South America and threaten food security in wheat growing areas in Asia and Africa. In February 2016, wheat blast was spotted in Bangladesh– its first report in Asia. Wheat is the second major food source in Bangladesh, after rice. The blast disease has, so far, caused up to 90% yield losses in more than 15000 hectares. 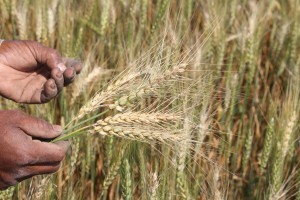 Scientists fear that the pathogen could spread further to other wheat growing areas in South Asia. To rapidly respond to this emergency, our team is making genetic data for the wheat blast pathogen available via this t website and we are inviting others to do the same. Our goal is that the OpenWheatBlast website will provide a hub for information, collaboration and comment. Collectively, we can better exploit the genetic sequences and answer important questions about the nature of the pathogen and disease. For example, we can determine whether the Bangladeshi wheat-infecting strain has evolved independently from local grass-infecting fungi or was somehow introduced into the country. Our first response is to apply a method described in 2015 called “Field Pathogenomics“, which enables a rapid response to an epidemic by generating highly-specific genetic information directly from diseased plant samples. Central to our approach is that all data and analyses are immediately released publicly without any restrictions through OpenWheatBlast and the associated Facebook page. We hope these pages will provide a hub for information, collaboration and comment to rapidly share analyses with Bangladeshi scientists and the wider international community. Detection and confirmation of wheat blast disease by BARI scientists in Bangladesh. Report. April, 2016. Click here to find out the consequences of inaction. @djWHEAT Well this is a blast from the past. Wheat and Summa forever! Copyright © 2019. Created by Joe Win using Shamrock by MEKS. Powered by WordPress.